This one is more aromatic than I remember cask 900148. Haven't tasted them head-to-head though. Caramel, apple, hazelnut, fig, orange and curry. With water 'schuimblokken', hard marshmallow. Cherry, orange, peach and hazelnut. Caramel, orange, cherry, apple, hazelnut and fig. A dry aftertaste. One of the heaviest Ultimate I ever tasted. But... one hell of a whisky. Very good. The alcohol, off course, its heavy one, but then : all sherry notes and influences, dried fruit , figs, raisins, tropical fruit also. Complex. Very warming, complex, spiced sherry notes. Again : raisins, prunes, sweet and spicy. But also flavourful. Very nice. A pleasant dark spiced sweetness comes forward to you. Complex finish. Long and strong. All the notes comes together in the end. A must buy that unfortunately isn't for sale anymore! First off, alcohol, which shouldn't be a surprise. But then, my goodness! Sherry, fresh fruits combine amazingly with the more dried fruit notes. Especially grapes and figs but also cherries and some tropical fruits. What a rush. Warming, oozing rushes of spiced sherry notes. Raisins, prunes, very sweet and spicy. Amazingly flavourful. Slightly dry, but a pleasant lingering dark spicy sweetness. What a smell. Full sherry, lots of red fruit and some alcohol. Full taste with lots of dates, raisins and fresh fruit. Alcohol clearly present, you notice that he is young. Oompfh this is heavy sherried stuff. Initially it does not have anything to do with Glenlivet anymore. It is just packed and loaded with sherry, sherry and more sherry, to top it off with a lot of alcohol. Now this doesn’t sound that positive maybe but don’t get me wrong, it is a hell of a drink!! Over time I started to appreciate this even better since the oxidation really restored the balance a bit with a little less sherry and a little more Speyside/Glenlivet. And I just do like to taste a little regional characteristics as well. With a serious oxidation on an almost empty bottle there is apples and pears comming through again. Just enough to mention it and give you more then just a big sherry bomb. Very creamy and full bodied. Sweet and dry. But on the taste in desperate need of water, like in a whole lake of it. Again after the longer oxidation on the almost empty bottle, I started to recognize a little more of the Glenlivet/Speyside profile again. Does it ever end? I mean, seriously, one dram is enough until next morning. Don’t bother brushing your teeth to get rid of the taste. 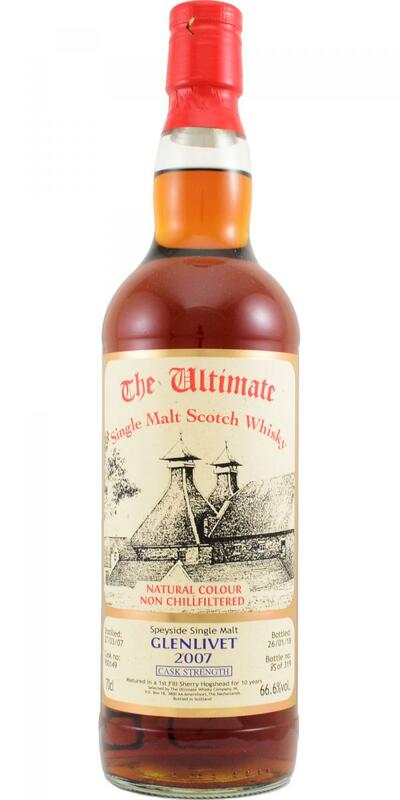 Red fruits, warm sherried wood and a very smooth, soft mouthfeel.